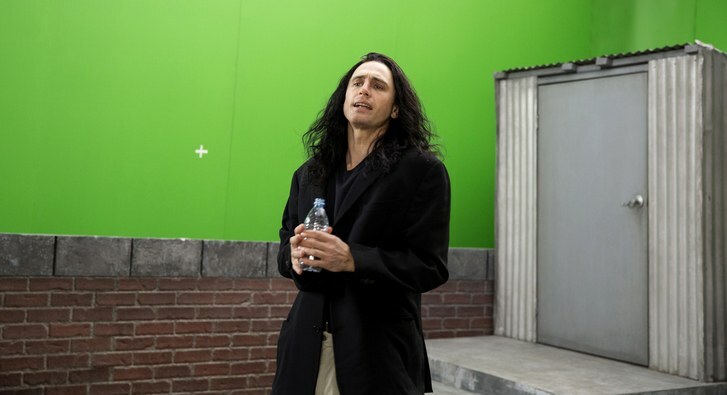 The Video: ‘The Disaster Artist‘ comes with a great 1080p HD transfer and is presented in 2.40:1 aspect ratio with some clips of the original film ‘The Room‘ interspersed in at 1.85:1 aspect ratio. Even though the original film was shot on a low budget without super high def equipment, this film is ready for 4K UHD, however there doesn’t seem to be that option here yet, rather just the Blu-ray version. The image isn’t too bright or vivid in most scenes, but rather is shot in slightly lower lit scenes, inside apartments or inside studios. The exception is when the scene takes place outside in the sun, which is where bright primary colors boast nicely. The end of the film at the premiere showcases the bright neon lights at the theater, bringing out those bold colors nicely. Other than that, colors can look a little bit muted with earthy tones. Black levels are deep and inky at all times and skin tones look natural for the most part. Detail is sharp and vivid too, even in the lower lit scenes, which reveal great closeups on the actor’s faces. You can see every strand of Dave Franco’s fake beard and every pore and piece of makeup on James Franco’s face. Wider shots look just as impressive and never soft. Lastly, there were no hiccups with any banding, aliasing, or video noise, leaving this image with very good marks. The Audio: This release comes with a good lossless Dolby TrueHD 7.1 mix that utilizes all the best sounds on the speaker system. Being on a movie set, there are tons of noises that can come into play and this track completely captures each and everyone one of them. When the entire crew is shooting scenes with the actors, you can hear camera equipment and every loud voice from the crew coming over the speakers with very good directionality. It’s a very good and immersive experience. Other city sounds of Los Angeles traffic and people walking on the street sounds great too. The scene in the movie theater brings the low end of bass with thunderous applause and chants of “Tommy”, which sounds great. The score and music of the film always adds to the comic flow and more dramatic moments with ease and never drowns out any other sound aspect. The dialogue is also clear and easy to follow for the most part. I say for the most part, because the Tommy Wiseau dialect is sometimes difficult to understand, but it’s all part of the fun. There are zero pops, cracks, hiss, or shrills. 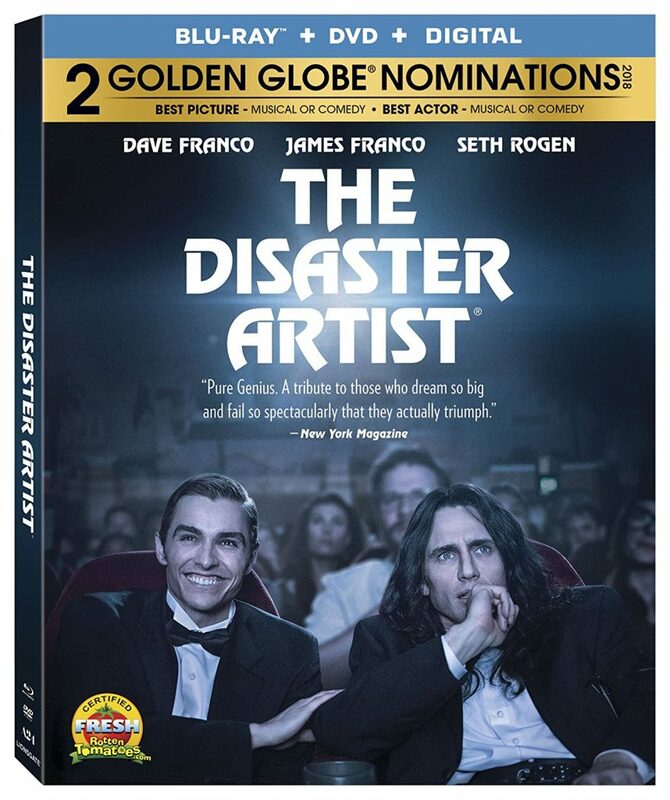 Audio Commentary – James Franco, Dave Franco, Tommy Wiseau, Greg Sestero, Scott Neustadter, and Michael H. Weber all appear on this commentary track, which can sounds chaotic and crowded at times. Again, it’s difficult to understand what Wiseau is saying most of the time as well, but none-the-less, this is an informative and fun commentary track that talks about making the film, casting, the cult status, and more. Oh, Hi Mark: Making a Disaster (HD, 13 Mins.) – This is a promo EPK piece of fluff that has interviews with the cast and crews, some of which are entertaining. On set footage is included too. Directing a Disaster (HD, 7 Mins.) – There are more interviews here, but his is more of a James Franco highlight reel. Just a Guy Leaning on a Wall: Getting to Know Tommy (HD, 7 Mins.) – A ton of other actors, directors, and writers talk about Tommy Wiseau and his movie ‘The Room’. Gag Reel (HD, 4 Mins.) – Some flubbed lines, missed cues, laughter, and more. ‘The Disaster Artist‘ is a great and entertaining account at the look at perhaps the best-worst movie ever made and it’s eccentric characters. On top of that, it’s a story about loyalty and friendship in the most unlikely of places. With excellent performances all around and one hell of a story, ‘The Disaster Artist‘ is a fantastic film and should be seen. The video and audio presentations are both very good and there are some fun extras, even if it’s all surface material. This comes Highly Recommended! This entry was posted on Thursday, March 8th, 2018 at 4:52 pm	and is filed under Film, News. You can follow any responses to this entry through the RSS 2.0 feed. You can skip to the end and leave a response. Pinging is currently not allowed.